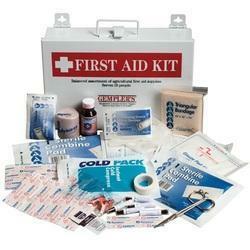 Leading Exporter of first aid kit and hygiene kit from Noida. We are involved in manufacturing First Aid Kit for various organizations. A first aid kit is a toolbox containing ointments, tablets, anti septic cream, bandages and other items for emergency treatment of the patients. Suitable For Daily Use Body hygiene or toiletry products at the time of travelling. We are offering a wide range of emergency relief items including Hygiene Kit that is also known as a body hygiene kit. It is a small size storage bag used to hold the body hygiene or toiletry products at the time of travelling. Our high quality kit includes toothpaste, dental floss, tongue cleaner, mouthwash, toothpicks, toothbrush (nylon bristle) and other oral hygiene products. 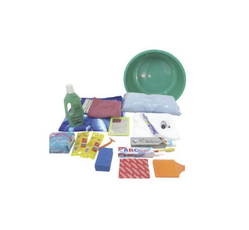 Besides these items, our hygiene kit contains detergent washing powder, toilet paper roll, tweezers, sanitary napkin, razor, shaving cream, ear buds, soap, body wash nail clippers towel, washable baby diaper, soap bar, soap dish, sewing kit, mirror, shampoo, hairbrush, comb and other products.